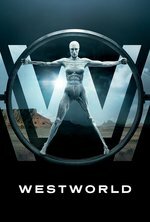 A pair of guests arrive at Westworld with different expectations; Bernard and Theresa Cullen debate about the recent host anomaly; a behavior engineer tweaks the emotions of a madam in Sweetwater's brothel; a cocky programmer pitches a new narrative. The original first watch FanFare post lives here. From the season finale FanFare post: Okay when Teddy glitches right off the train in Sweetwater and he sees all the bodies and the Dolores walking in front of the train tracks... why the hell was there a howl and then a wolf running by? Did I miss some wolf mythos or imagery at some point that my brain just filed under Game of Thrones? Yes, past elsie, you DID miss it. Because in this episode, Dolores glitches and sees all the bodies and there was a wolf running through the scene. Still not sure what it means, but it was there. Ah, I noticed the wolf this time and wondered about it. On retrospect, all the bodies in the glitch, why weren't there any customers still standing in that vision?